For sexually reproducing multicellular organisms such as plants and animals, the life cycle requires that diploid cells divide by meiosis to create haploid cells. Haploid cells then fuse to recreate the diploid number and a new organism. Alternation of generations refers to the occurrence in the plant life cycle of both a multicellular diploid organism and a multicellular haploid organism, each giving rise to the other. This is in contrast to animals, in which the only multicellular phase is the diploid organism (such as the human man or woman), whereas the haploid phase is a single egg or sperm cell. 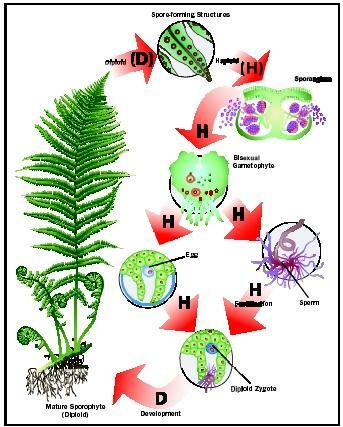 The fern is an example of alternation of generations, in which both a multicellular diploid organism and a multicellular haploid organism occur and give rise to the other. Alternation of generations is easiest to understand by considering the fern. The large, leafy fern is the diploid organism. On the undersurface of its fronds or leaves, its cells undergo meiosis to create haploid cells. However, these cells do not immediately unite with others to recreate the diploid state. Instead, they are shed as spores and germinate into small haploid organisms. Because the diploid organism creates spores, it is called the sporophyte generation of the life cycle. Upon reaching maturity, the haploid organism creates haploid egg and sperm cells (gametes) by mitosis . Because the haploid organism creates gametes , it is called the gametophyte generation of the life cycle. The male gametes (sperm) are then released and swim to the female egg. Fusion of the gametes creates the new diploid sporophyte, completing the life cycle. Whereas the fern gametophyte and sporophyte generations are completely independent, in some types of plants one generation lives on or in the other and depends on it for nutrition. In mosses, the familiar lush carpet of moss is the gametophyte, and its gametes require a moist environment for short-distance swimming before fusing. The sporophyte lives as a thin stalk attached to the gametophyte. Spores are released into the air and can travel on the slightest breezes to other habitats. In contrast, in flowering plants (angiosperms), the sporophyte is the dominant form. The male gametophyte has been reduced to just three cells, two of which are sperm. These together form the pollen grain, which is formed from the anther, part of the sporophyte. Similarly, the female gametophyte has been reduced to just seven cells, one of which is the egg cell. These are retained inside the ovule , which is part of the sporophyte. In angiosperms, two fertilization events take place: one sperm fertilizes the egg to form the diploid zygote of the new individual, and the other sperm fertilizes the so-called polar nuclei to form the triploid endosperm , a nutritive tissue. Together with maternal sporophyte tissue, these make up the seed. how about the alternation of generation of animals?